610-632: Islam was revealed to the Prophet Muhammad, seen by Sufis as the first Sufi. 700-800: Certain Muslims lived saintly lives and were later identified as Sufis. 850-950: The practices of Sufism were standardized. 922: Mansur al-Hallaj was executed. 1000-1111: The early classic literature of Sufism was written. 1166-1236: The earliest Sufi orders were founded. 1200-1240: Ibn Arabi wrote his classic Sunni mystical works. 1258-1431: New Sufi orders continued to be founded. 1248-1273: Jalal al-Din Rumi wrote classic mystical poetry in Persian. 1293-1328: Taqi al-Din Ahmad ibn Taymiyya criticized accepted practices, especially Sufi ones. 1389-1431: New Sufi orders continued to be founded. 1501: Ismail I was crowned Shah in Tabriz. 1612-1640: Mulla Sadra wrote his classic Shi’i mystical works. 1744-1818: Saudi forces inspired by Muhammad ibn Abd al-Wahhab persecuted Sufis. 1815-1859: New Sufi orders continued to be founded on the classic model. 1826: The Bektashi order was abolished by the modernizing Ottoman state. 1870-1920: Modernist reformers attacked Sufism as backward. 1883-1927: A major new order, the Mourides, was founded in Senegal. 1914: The first important Western Sufi order was founded, Inayat Khan’s Sufi Order. 1924: Sufism was banned in Mecca as heterodox. 1925: Sufism was banned in Turkey as backward. 1925-1960: Said Nursi promoted modernized Sufi views in Turkey. 1974-2014: The first important global Sufi order, the Haqqani order, was founded. For Sufis, the founder of Sufism is the Prophet Muhammad, who is also the founder of Islam. Every Sufi order knows the spiritual genealogy (silsila) of its master (shaykh or murshid), and every such Sufi genealogy starts with the living master, goes back to his own master (usually dead), then to his master’s master, and thence backwards to the Prophet and thus to God. 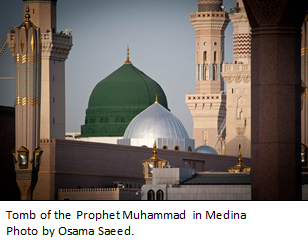 In one sense, the Sufis are right in seeing the Prophet Muhammad as their founder. Sufism is part of Islam, and Islam goes back to the Prophet Muhammad. In another sense, however, the Sufis are wrong, since there are no traces of what is today called Sufism in the historical record until the ninth century AD, 200 years after the death of the Prophet Muhammad. That, a Sufi would respond, is because the practice of Sufism was then so general that Sufism could not be distinguished from Islam as a whole. No single founder of Sufism other than the Prophet has been identified by historians, though there is agreement that one of the central figures is Junayd of Baghdad, then the political and cultural center of the Muslim world, who died in 910. Some earlier Muslims made important contributions to what would later become Sufism, however, including Rabia al-ʻAdawiyya, who died in 801. She is remembered for her prayers and fasting, and represents the ascetic strand in Sufism. Asceticism is part of the standard practices of Islam, all practicing Muslims fast, but Rabia took asceticism further than most. There were others like her, and one ascetic practice that some ascetics followed was the wearing of rough clothing, made of wool. This is the probable origin of the term “Sufi,” which literally means “wooly.” Among those who made significant contributions to Sufism before Junayd there is also Harith al-Muhasibi, who wrote on spiritual discipline, notably on the need for repentance and techniques for the careful examination of the conscience. Spiritual discipline is a second major aspect of Sufism. Finally, providing a third major aspect before the time of Junayd, there is Bayazid al-Bistami, who seems to have been one of the first Muslims to apply the understandings of philosophy to the understanding of spiritual states. Three major aspects of Sufism are visible before Junayd, then, as is Islam itself, which is the fourth (or perhaps the first) major aspect of Sufism. The significance of Junayd is that by the time of his death in 910, the distinctive practices and doctrines of Sufism are all visible in one place. This happened at a point in the history of Islam when many other Islamic doctrines and institutions were also reaching their mature forms. 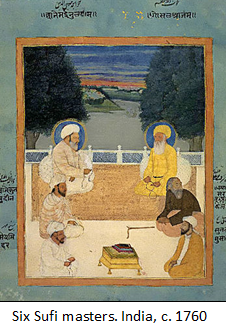 The process of the emergence of Sufi practice and doctrine was attended by controversy. Some Sufis were so immersed in the divine that they became distracted, and behaved in unacceptable ways. Mansur al-Hallaj is said to have caused scandal in Baghdad by his strange behavior, and especially by announcing “I am the Truth,” thus claiming for himself one of the names of God (the Truth). He was executed in 922, a rare event in the history of Islam, as executions for religious views are extremely unusual. Some in fact argue that al-Hallaj was actually executed for his political activities, not for his religious views, and that in reality he never uttered the famous words for which he is remembered. Whatever the truth, he became one of the well-known Sufis whose biographies helped fix the Sufi identity, along with other saints whose hagiographies were recorded in works such as the Tabaqat al-Sufiyya of Abu Abd al-Rahman al-Sulami, a work competed by 1021. The doctrines and practices of Sufism were further formalized over the next century, notably by Abu Ḥamid al-Ghazali, whose long and comprehensive Ihya ulum al-din also aimed at reconciling Sufi views with those of non-Sufi Muslim scholars. These two varieties of literature, then, were added to the practices and doctrines of Sufism that had already emerged. The body of Sufi practice, doctrine, and literature was largely complete by the death of al-Ghazali in 1111, but Sufi organizations, the Sufi orders, emerged only later, mostly during the twelfth and thirteenth centuries. These included the Qadiri order or Qadiriyya, the Chishtiyya, and the Shadhiliyya. One great Sufi order, the Naqshbandiyya, did not come into being until the fifteenth century, and new Sufi orders have continued to be founded over subsequent centuries, with important new Sufi orders appearing even in the twentieth century. By the fourteenth century, Sufism as it exists today becomes fully visible. Sufi orders were then found throughout the Muslim world, and had become part of the religious establishment. They were important in the religious life of communities and individuals, and also in other areas of life beyond the religious sphere. Sufis were among the most popular poets in Arabic, and the Sufi poet Jalal al-Din Rumi, who died in 1273, composed some of the most beautiful poetry even written in the Persian language. Some Sufis were warriors, manning forts one the edges of the Muslim world. One Sufi master from the Safavid order, Ismail, led his followers in a successful campaign of conquest that saw him crowned Shah Ismail I in Tabriz, Persia, in 1501. He founded the Safavid dynasty that ruled Persia until 1736. Other Sufis became rulers in other places at other times, but none established a dynasty that ruled so widely for so long. In commercial life, some Sufis were long-distance traders, preaching Sufism and Islam as they traveled. The spread of Islam in sub-Saharan Africa and Southeast Asia was mostly the work of Sufis, bringing Islam as well as the goods that they traded. From the fourteenth to the eighteenth century, then, Sufism was central to the religion of Islam, and also of great importance to the artistic, military, political, and commercial life of the Muslim world. During the nineteenth century, however, Sufis began to experience difficulties. Sufism had been criticized as un-Islamic in the eighteenth century by a radical revivalist preacher, Muhammad ibn Abd al-Wahhab, and from the nineteenth century onwards these criticisms began to have some impact. The nineteenth century also saw modernization programs in many parts of the Muslim world, and as states began to modernize, the power and influence of the Sufi orders began to appear problematic. In 1826, the government of the Ottoman Empire banned and dissolved the Bektashi order, which was too closely associated with the over-privileged Janissary military order, itself destroyed as an obstacle to building a strong, modern state. Towards the end of the nineteenth century criticism of Sufism spread in other circles. Modernist intellectuals such as Muhammad Abduh in Egypt began to criticize Sufism as backward and superstitious. The difficulties that had started in the nineteenth century became worse in the twentieth century. The 1920s were the worst decade for Sufis since the execution of al-Hallaj in 922. 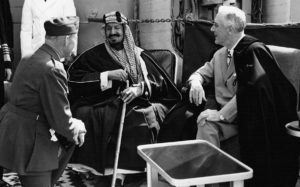 First, in 1924, Saudi forces inspired by the anti-Sufi revivalism of Muhammad ibn Abd al-Wahhab conquered Mecca, Islam’s holiest city, and banned Sufi teaching and practice there as un-Islamic. Sufism remains banned in Saudi Arabia today. Then, in 1925, the modernizing Republic of Turkey banned Sufi orders and practice as backward, seizing Sufi property and assets. Sufism is still technically illegal in Turkey today, though in practice restrictions were informally eased in the 1950s, and Sufi orders now again operate in Turkey, unofficially. Despite these setbacks, Sufism remains important. Notable new orders were founded outside major urban centers during the nineteenth century, notably the Tijaniyya and the Sanusiyya. 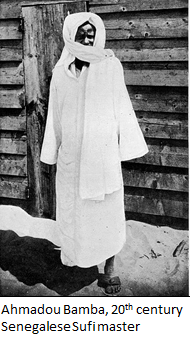 Even in the twentieth century there are some places where neither anti-Sufi revivalists nor anti-Sufi modernists have made much progress, and these include Senegal in West Africa, where during the first part of the twentieth century Amadou Bamba established the new and fast-growing Mouride order as one of his country’s most important influences. The Mouride headquarters at Touba have since grown to become a city with over 500,000 inhabitants. In other places, some Sufis adapted successfully to the hostile conditions of the times. In Turkey, Said Nursi observed the ban on Sufi orders, but wrote and published extremely successful books that promoted modernized Sufi views, spreading Sufi teachings to new audiences. 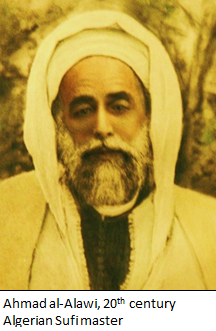 In Morocco, the Boutchichi order used a variety of techniques to establish a large following among groups such as university students that had elsewhere become hostile to Sufism. In the twentieth-century West, Sufism began to spread among those disenchanted with modern materialism and looking for satisfying spiritual alternatives. Rumi became one of the best-selling poets in America, and Western Sufi orders became established. The first of these, the Sufi Order founded in London in 1914 by an Indian Sufi, Inayat Khan, espoused a version of Sufism that was extensively adapted for Western audiences, and was not especially Islamic. This and similar “universalist” Sufi orders paved the way for more classic Islamic Sufism, such as the Haqqaniyya of Nazim al-Haqqani, a Turkish Sufi, which became the world’s first truly global Sufi order. This and similar Sufi orders are among the major causes of conversion to Islam in the West today. Sufism, then, originated with Islam, became visible in the ninth century, and enjoyed its golden age between the fourteenth and eighteenth centuries. It has declined in importance in the Muslim world since the nineteenth century, but remains important, and is moving into new areas. Sufis share the standard beliefs and doctrines of other Muslims in the places where they live. There are thus Sunni Sufis in Sunni Muslim communities, and Shi’i Sufis in Shi’i Muslim communities. Sufism is sometimes understood by Westerners as a distinct denomination within Islam, like Sunnism or Shi’ism, but this is incorrect. In addition to the standard beliefs and doctrines of other Muslims, Sunni or Shi’i, Sufis also emphasize certain beliefs that Muslims who are not Sufis either do not emphasize or do not hold. The most important of these is the belief that certain human beings are especially close to God. 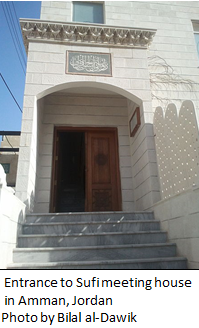 All Muslims believe that the Prophet Muhammad was especially close to God, from whom he received the revelations that are the basis of Islam, and both Sunni and Shi’i Muslims believe that certain other persons in the early history of Islam were also especially close to God, though not as close as the Prophet. Sufis place many more people, including people in later ages and even today, in the same category. They call such persons walis. Wali is translated as “saint,” but in fact it means “friend” or “protector.” Those whom Sufis call walis are actually walis of God, friends of God, a phrase used in the Quran, where it is said that the walis of God need neither fear nor grieve. The Sufi belief in saints leads to other beliefs. One is that it is good to follow a teacher or master who is a saint, as such a teacher has special access to the divine. Another is that a saint is a source of divine blessings (baraka). All Muslims believe that divine blessings bring both spiritual and material benefits, but it is the Sufis who see the saints as a major source of such blessings. This belief covers both live and dead saints, and leads Sufis to seek blessings at the tombs of dead saints. It is not only Sufis who believe in saints and visit tombs in search of blessings, however. Many ordinary Sunni Muslims do this as well, and all practicing Shi’i Muslims visit the tombs of their earliest leaders, the imams. 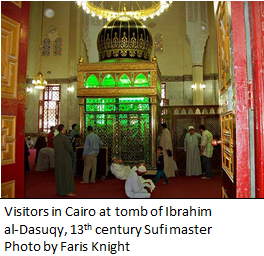 Not all Muslims visit tombs, however, while all Sufis believe in saints, and most Sufis therefore visit tombs as well as following living saints as masters. The second most important Sufi belief is that a distinction can be made between two types of self, the soul (ruh) and the ego (nafs). The soul is immortal, while the ego is not, and the ego must be placed under control. Animals are pure ego, following every whim or desire, and that is fine, because that is how God made them. Human beings, in contrast, should learn not to follow their whims and desires, and instead exercise discipline over their egos. The Sharia, the divinely ordained code of Islam that covers worship and behavior as well as law, is not just a list of instructions to be followed unthinkingly, but also a path that leads to this goal. A Muslim may follow the minimum demands of the Sharia and hope for God’s mercy on the day of judgment, and that is fine, and appropriate for most people. Alternatively, a Muslim may follow a much more demanding program including a variety of extra practices aimed at completely subduing the ego, and this is what many Sufis believe that Sufism is about. The third most important Sufi belief is in the mystical experience, sometimes called union or illumination (fana or fath). Western scholars of religion once also believed in the existence of a mystical experience, which some scholars saw as central to religion, but the general tendency today is to treat any so-called mystical experience with extreme caution. Whether or not the mystical experience “actually” exists, however, certain Sufis from Bayazid al-Bistami in the ninth century to our own day have reported that experience, which forms one of the bases of Sufi doctrine. Most Sufis report only lesser forms of religious experience, but most Sufis believe that union with the divine is possible. Saints are generally expected to have experienced it. Mystical union is understood by Sufis partly in terms derived from the Quran, some passages in which provide wide scope for interpretation, and partly in terms derived from philosophy. Since Arabic philosophy was developed on the basis of late antique Hellenistic philosophy, Neoplatonic and Gnostic concepts and understandings form part of Sufi doctrine, though very few Sufis have the necessary grasp of intellectual history to realize this. The great mystical writers of Sufism, such as Ibn Arabi and Mulla Sadra, are thus part of the great universal philosophical tradition that the Hellenistic world, Islam, Judaism, and Christianity all hold in common, a tradition that is familiar to many in the West as Scholasticism. For some Sufis, further beliefs follow from this philosophical tradition. The soul (ruh), for example, may be seen as an emanation of the Universal Intelligence, which may itself be seen as one of a series of emanations from the Necessary Being, who can be described only in terms of negative attributes. In a certain sense, then, the human soul shares in divinity as it struggles to return to its origin. Such philosophy, however, is not easy to follow, and is a minority interest among Sufis, most of whom are not philosophers. Most Sufis in earlier ages, in fact, were illiterate (as, of course, were most non-Sufis). Interest in poetic imagery is more widespread. God is described in the poetry written by Sufis such as Rumi as the beloved, and the mystical experience is described as intoxication. The tavern may thus be described as preferable to the mosque, or the mosque described as of no more importance than the church or the temple of the idolater. Such images are deliberately risqué, which is one source of their literary power. They can, however, easily give rise to misunderstanding. They are one source of a long-running disagreement among Western commentators about the attitude of Sufis to other religions. Some have argued that Sufism is essentially tolerant and friendly towards Christians and agnostics. Others have argued that an image should not be understood literally, and that Sufis take their understandings of other religions from Islam in general, not from Sufism or poetry. Since there have been many Sufis over many centuries, particular groups of Sufis in particular times and places have believed many things in addition to the beliefs described above. Some, for example, have believed that the battle to master the ego can be helped by public condemnation, and that public condemnation can usefully be attracted by public bad behavior. Some have believed that narcotics assist meditation. Some have believed that one particular saint is much more than just a saint, perhaps a god. Some have taken beliefs from the smaller Islamic denominations, including the Ismailis and the Druze. There is considerable variety in Sufi doctrine, then. But nearly all Sufis believe in saints and blessings, the need to control the ego, and the possibility of mystical union. Many Sufis have drawn on the philosophical and poetic traditions. Only very few Sufis have found spiritual benefit in narcotics, or have taken saints as gods. Sufis follow the standard practices of Islam, though there have been occasional exceptions to this rule, especially in earlier centuries, when some Sufi ignored parts of the Sharia. They pray the ritual prayers, they give alms to the poor if they have the means to do so, they fast during Ramadan, and if they can afford it they go on pilgrimage to Mecca. They may, however, go further than non-Sufi Muslims do. As well as the obligatory ritual prayers, there are optional (sunna) prayers, and Sufis are more likely than most to perform these, and to perform more of them. Some Sufis give far more in alms than they are obliged to, perhaps keeping only the minimum for themselves. Many Sufis fast not only during Ramadan, but also on other days at other times, and some fast not only from food and drink as is normal, but also from sleep or speech or even human society. Asceticism was one of the original practices of the earliest Sufis, and remains an important practice today, though the forty-day retreat from human society that was once quite standard is now much less common than it used to be. As well as going on pilgrimage to Mecca, Sufis also visit the tombs of saints in search of blessings, as do many other Muslims. In many Muslim countries, annual anniversary celebrations (mawlid ) are arranged at the tombs of great saints, sometimes lasting for days, and many or even most local people join in the general celebration, whether or not they are Sufis. 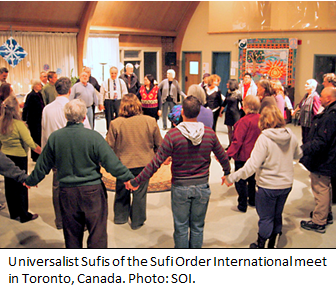 In addition to these practices, there are both individual and group practices that are specific to Sufis. The main individual practice is devotion to the master of the order to which a Sufi belongs or, in the case of a Sufi who is the master of an order, to his own former master, now deceased. A Sufi loves his master and follows his example in all things, not only in matters of ritual but also in modes of behavior, and even perhaps of dress. A Sufi also obeys his master in all things, asking his master’s advice and permission before making major decisions, even in his private life. Love and obedience are important spiritual practices. In addition to this, the main formal individual practice of a Sufi is the litany (wird or wazifa). This consists of the repeated recitation of specific passages from the Quran and of other prayers. The prayers are generally short, but may each be repeated hundreds or even thousands of times, so that the litany as a whole can take a long time to perform. 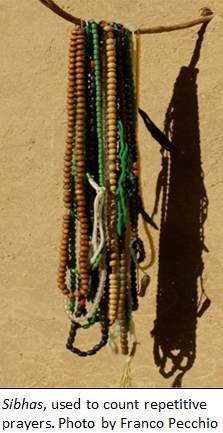 Stings of beads (sibha) are used to count the repetitions. The litany is typically repeated every day after the morning and evening ritual prayer. It varies from order to order, and an order’s master may vary the litanies given to different individuals. It is in some ways a form of meditation, and is sometimes accompanied by other forms of meditation, which might for example involve forming a mental image of the Sufi master, and by various exercises in self-examination. The main communal practice of Sufism is the dhikr, named after the Arabic word for remembrance, and generally performed once a week. The dhikr is a collective litany, during which a number of Sufis, normally between 20 and 200, meet to chant repetitive prayers together, following a particular rhythm, sometimes marked by a drum. Other musical instruments such as pipes or a gong are also used in some orders. The chanting is generally accompanied by physical movements, typically of the upper body, and breathing patterns. During dhikr, Sufis often sit or stand in a circle, but sometimes a row is used instead of a circle. The precise form of the dhikr, like the words of the litany, varies from one order to another. The degree of choreography also varies. Some dhikrs are restrained and careful performances, while others are unrestrained and even wild. The dhikr of an urban order with many educated members will normally be more restrained than the dhikr of a rural order with few educated members. 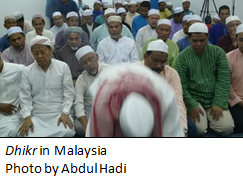 Styles of dhikr also vary by region: African dhikrs and Malaysian dhikrs, for example, have distinct styles. All dhikrs, however, are significant experiences, both for those engaged in them and for spectators. Some participants fall into states of ecstasy, especially in certain orders. Spectators are sometimes present in small numbers by invitation, and sometimes in larger numbers when a dhikr is held in a public place. They are generally welcome, as the dhikr serves as publicity for the order, and all orders welcome new members. Two unusual varieties of dhikr are especially dramatic and often draw large crowds. One is associated particularly with the Rifa’i order, and involves participants demonstrating the extent of control over the material by piercing parts of the body with skewers and spits, or by handling poisonous snakes, and remaining unharmed. 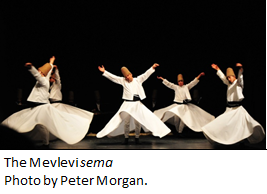 The other variety of dhikr is associated with the Mevlevi order, and involves “turning,” often called “whirling.” The Mevlevis are often known in English as “whirling dervishes,” dervish being a Persian-Turkish word for Sufi. Rather than just moving the upper body as is standard during dhikr, the Mevlevis turn the whole body through 360 degrees, multiple times. The technique of turning without becoming dizzy is more easily learned than the technique of piercing with skewers and spits without being hurt, and part of the point of turning is its beauty, which is accentuated by the billowing white dress and tall cap worn by the Mevlevis, and by the flute music that accompanies their turning. Mevlevi turning is now often performed in Turkey as a form of folkloric dance for the entertainment of tourists, not as a religious ritual. There are still, however, some Mevlevis who turn as a form of dhikr. The Rifa’i dhikr and the Mevlevi sema (as the Mevlevi dhikr is called) are both atypical. The more normal dhikr is really the communal form of the litany, and is much more representative of standard Sufi practice. The heart of Sufi practice, though is not dramatic ritual but quiet and invisible self-discipline, learned through ascetic practice and also through submission to the Sufi master. Sufi masters use a variety of techniques for teaching, testing and training their followers. There is no single Sufi organization. Sufis are organized in Sufi orders (tariqa) led by masters (shaykh). The Sufi order is the framework for Sufi practices, and the master is the spiritual director. Both order and master are also important sources of identity, and a focus for social activity and fellowship. Sufi orders resemble Christian monastic orders, but differ in that they are part-time. Christian monks leave the world for a monastic order and remain there, sometimes in cloistered seclusion, but Sufis live in the world, with jobs and families, while also belonging to a Sufi order. Logically, only saints should be Sufi masters, but in practice this logic may be reversed, and the fact that a person is a Sufi master may lead to the belief that he is a saint. Many Sufi masters become masters not because they are obviously saints but because they are the most suitable candidate to replace another master who has just died, and often the reason that they are the most suitable candidate is that they are the son of the deceased master. This gives rise to hereditary dynasties of saints, whose position may be strengthened by inheritance of suitable real estate, including tomb sites. Although there is no formal distinction between hereditary saints and “real” saints, in practice a person who seems to be a “real” saint, and who perhaps has learning as well as charisma, is much more likely to build up a large following than a merely hereditary saint, and may even found a new Sufi order. A hereditary saint, in contrast, will often preside over an order that is declining in size and importance. While there are always some orders that are expanding, then, there are also others that are declining. Those belonging to a new and expanding order will often be deeply committed to it, to their master, and to Sufism and Islam, while those who belong to a declining order may belong simply because of family tradition, participating in activities only occasionally. If someone who belonged to a declining order became especially committed to Sufism, they might well shift to a new and expanding order. Even among deeply committed Sufis, there are variations. A few deeply committed Sufis live for their master and order, traveling with him when he travels, paying little attention to life outside the order. Some deeply committed Sufis focus their lives on their master and order, visiting whenever they have time free. Some Sufis, however, remember their master and order only when they have nothing else to occupy them. And some remember their order only when reminded of it, and are not always scrupulous in their Islam either. While gender makes little difference for Sufis in terms of beliefs or practices, Sufi organization is normally divided by gender, as are all other types of organization in the Muslim world. Sufi masters are almost always male. Most publicly active members of Sufi orders are also male, since Sufis normally follow the same gender practices as other Muslims, and in most parts of the Muslim world, public religious rituals are attended primarily by men (women pray at home). Certain tombs are visited especially by women, however, and women may also belong to Sufi orders. As gender roles within Sufism normally follow local norms, and local norms are currently changing, especially in urban areas, so gender roles within Sufism are also now changing. In societies where it has become normal for women to be educated, there are often parallel arrangements for women in Sufi orders. In societies where it is now normal for women to follow professions at advanced levels, women may also occupy senior positions in Sufi orders. Female university professors have recently taken prominent positions in Sufi orders in Lebanon and Morocco, for example. In America, women may even run Sufi orders. Sufis follow the leadership of other members of the order to which they belong as well as the leadership of their master. Some orders are small enough for all the Sufis in them to have frequent personal contact with their master, but many are so large that all that is possible is an occasional glimpse of the master, perhaps at a large public gathering. In large orders, a hierarchical structure is therefore found. This may be informal or formal. When it is informal, newer Sufis simply listen to and learn from those who have spent longer in the order than they have. When it is formal, the master will appoint representatives (various terms are used) to assist in particular tasks or to run small groups in other towns or villages. These representatives may be given authorization (idhn) to admit new members into the order. Some orders have also developed complex systems of ranks and grades below the master and his representatives, but this is unusual. Orders vary considerably in size. A small order may consist of no more than twenty people, have no property, and be led by a part-time master who lives off some other activity, perhaps as a teacher or merchant. A large order may have many thousands of followers, own tombs and mosques and hostels, and be led by a full-time master who lives off the gifts of his followers. Occasionally, an order may have millions of followers and a full-time staff to run it, but this is very unusual. Sufism is more about personal contact than about size. Sufi orders can be confusing because the largest orders of all have no organizational existence. Over almost a thousand years, ancient orders such as the Qadiriyya or Naqshbandiyya have spread across the whole Muslim world, and among Muslim minorities outside it. There are Qadiris in China, Egypt, and California. These Qadiris all have in common a reverence for their founder, Abd al-Qadir al-Jilani, and the use of certain prayers and practices, but nothing more. The world-wide Qadiriyya has no central leadership. Instead, there is a local leadership in each area where the Qadiriyya operates. In China’s Gansu Province, for example, there are now at least twelve independent Qadiri orders, one of which was founded as recently as the 1950s. A Sufi in Gansu Province, then, might belong to the Gaozhaojia Qadiri order, so-called because it was founded by Mashihaya from Gaozhaojia, or to the Yatou Qadiri order, so-called because it was established in the village of Yatou. Mashihaya, the founder of the Gaozhaojia, was himself a former member of the Yatou, a typical way in which an order spreads. The Gaozhaojia is reported now to have some 200 members, and so is not in itself of great significance on a global scale. Sufism as a whole, however, is of significance on a global scale, and individual Sufis are Sufis as a result of their membership of small local organizations like the Gaozhaojia. Sufi orders would be easier to understand if there were different terms for global orders like the Qadiriyya and for local orders such as the Gaozhaojia, but unfortunately the same term is used for both. Ever since the execution of Hallaj in 922, Sufism has been controversial. From the tenth century onwards, Sufis have explained that Sufism respects the Sharia, and that the Sharia is the essential vessel that holds the truths of Sufism. That so many Sufis have explained this so often over the ages shows the persistence of the suspicion among other Muslims that there is some fundamental problem with Sufism. One issue with Sufism is that its emphasis on the personal experience of the divine inevitably seems to deemphasize other aspectsof Islam. If the Sharia is a means to mystic union, what need does someone who has experienced mystic union have for the Sharia? As Sufi poetry sometimes asks, is not the tavern more attractive than the mosque? And might not some Sufis actually be found in real taverns, not just symbolic ones? Suspicions of this sort have made problems for mystics in other religions, not just for Sufis. Sufis have also, however, suffered from accusations that their doctrines and practices are un-Islamic and therefore Islamically unacceptable. One of the first major critics of Sufism as un-Islamic was Taqi al-Din Ibn Taymiyya, an independently-minded Syrian scholar of the thirteenth century who criticized many religious and social practices of his time and came into repeated conflict with the civil authorities as a result. He objected especially to the mystic theology of Ibn Arabi, to the idea that saints could intervene with God on behalf of other humans, and to the visiting of tombs. His was a lonely voice, however, and died in jail. His criticisms had little or no impact on the status of Sufism at the time. Similar ideas, however, were expressed four centuries later by another independently-minded scholar, the hardline revivalist preacher Muhammad ibn Abd al-Wahhab, who lived and taught on the edge of Muslim world, in the sparsely-populated deserts of east-central Arabia. While Ibn Taymiyya came into repeated conflict with the civil authorities in Syria and Egypt, Ibn Abd al-Wahhab made an alliance with a local ruler in Arabia, Muhammad ibn Saud. That alliance secured the position of Ibn Abd al-Wahhab and his doctrine, and provided the basis for what is now the Kingdom of Saudi Arabia. As noted above, Sufism was banned in Mecca in 1924, and has since been widely attached by those who share the perspectives of Ibn Abd al-Wahhab. This includes members of the Salafi movement, which is the single most important Islamic movement in the world today. Salafism is so large that its diversity makes it hard to define, and sometimes it seems that the one thing that all Salafis have in common is a hatred of Sufism. 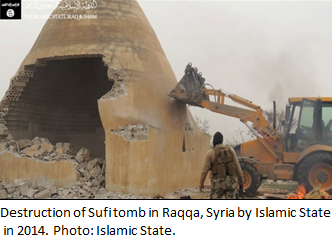 The Salafis of the so-called Islamic State frequently destroy Sufi tombs. Sufis, in response, reject Salafism. There is some basis to the argument that Sufism is un-Islamic, as there is no evidence for the existence of Sufi doctrines or practices at the time of the Prophet. The Quranic verses which Sufis use to justify their positions do not really provide much justification. Certainly, it is stated in the Quran that the walis of God need neither fear nor grieve, for example, but there is nothing to show that what Sufis mean by wali is the same as what was meant by wali in the Quran. Mixing Quranic terminology with perspectives derived from Hellenistic philosophy does not change the fact that those perspectives are in their origin Hellenistic rather than Quranic. In a sense, then, the Islamic critics of Sufism are right. The problem with their argument, however, is that it was not just Sufism that first becomes visible in the historical record two or three centuries after the death of the Prophet, but also many other aspects of Islam. Much of the Sharia is grounded in the later consensus of scholars rather than in the text of the Quran. 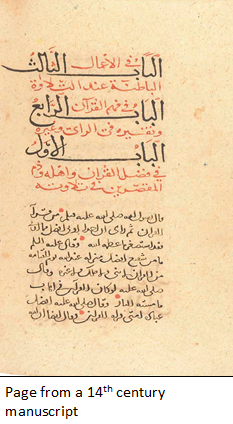 Many concepts used in the theology of all later Muslim scholars, including Ibn Taymiyya, are of Hellenistic origin. The word “Sharia” appears only once in the Quran, and when it does, clearly means something quite different. Islam may have originated with the Prophet Muhammad, but its interpretation and institutionalization was the work of later generations. In the end, then, the view of Sufism as un-Islamic cannot be sustained. Just as the Islamic opponents of Sufism argue that it is un-Islamic, so some non-Islamic enthusiasts of Sufism argue that it is non- Islamic. These include many of the followers of the Sufi Order established by Inayat Khan in London in 1914, which now has branches everywhere, including America’s west and east coasts. Similar arguments are made by the readers of Idries Shah, whose work was extremely popular in the West in the 1970s to 1990s, and the followers of some “universalist” Western Sufi orders. There is again some basis to this argument. Sufism may be understood as mysticism, and mysticism is not just Islamic. Something that can be identified as mysticism existed before Islam, and exists outside Islam. The trouble with this argument, however, is that while it is possible to find mysticism within Sufism, much that is within Sufism is not mysticism. As we have seen, much is specifically Islamic. In the end, then, the view of Sufism as non-Islamic cannot be sustained either. Sufism is part of Islam. Al-Ghazali, Abu Hamid. 2010. The Marvels of the Heart: Science of the Spirit. Trans. and ed. Hamza Yusuf. Louisville, KY: Fons Vitae. Al-Ghazali, Abu Hamid. 1986. Inner Dimensions of Islamic Worship. Trans. Muhtar Holland. Leicester: The Islamic Foundation. Al-Haddad, ‘Abdallah Ibn Alawi. 2003. The Book of Assistance. Louisville, KY: Fons Vitae. Al-Jilani, Abd al-Qadir. 1992. The Secret of Secrets. Trans. Tosun Bayrak. Cambridge: Islamic Texts Society. Bin Ramli, Harith. 2010. “The Rise of Early Suﬁsm: A Survey of Recent Scholarship on its Social Dimensions.” History Compass 8:1299-1355. Ernst, Carl W. 1997. The Shambhala Guide to Sufism. Boston: Shambhala. Green, Nile. 2012. Sufism: A Global History. Oxford: Wiley-Blackwell. Ibn-Al-Arabi. 1980. The Bezels of Wisdom. Trans. R.W.J. Austin. Mahwah, NJ: Paulist Press. Jamal, Mahmood, ed. and trans. 2009. Islamic Mystical Poetry: Sufi Verse from the Early Mystics to Rumi . London: Penguin Books. Ridgeon, Lloyd, ed. 2015. The Cambridge Companion to Sufism. Cambridge: Cambridge University Press. 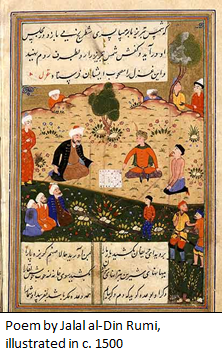 Rumi, Jalal al-Din. 1996. The Essential Rumi, ed. Coleman Barks. San Francisco: Harper San Francisco. Sedgwick, Mark. 2003. Sufism: The Essentials. Cairo: American University in Cairo Press. Sells, Michael Anthony, ed. 1996. Early Islamic Mysticism: Sufi, Qur’an, Mi’raj, Poetic and Theological Writings. Mahwah, NJ: Paulist Press.